On this page I put together a collection of statics problems to help you understand static equilibrium better. The required equations and background reading to solve these problems is given on the equilibrium page. The general equation for drag acting on a body is given by D = (1/2)CρAv2, where C is the drag coefficient, ρ is the density of the fluid through which the body is moving, v is the speed of the body relative to the fluid, and A is the projected cross-sectional area of the body perpendicular to the flow direction. For a skydiver of mass m, what is the constant (terminal) speed reached during the fall? A cylinder of mass m and radius r is being pushed on flat ground at constant speed without slipping, with a horizontal force F acting at the geometric center O of the cylinder. 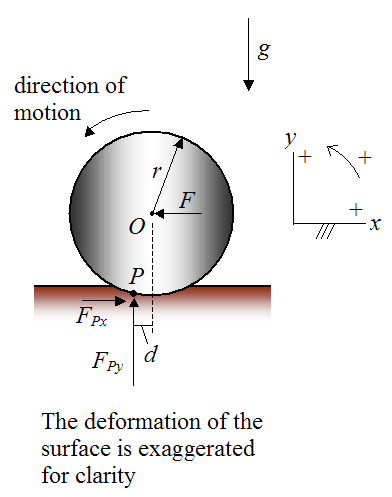 The resultant force acting on the cylinder due to contact with the ground acts through point P, which is a small horizontal distance d from point O, as shown. This resultant force can be broken down into horizontal and vertical components FPx and FPy, as shown. Since the cylinder is rolling at constant velocity with no slipping, its angular acceleration is zero and its center of mass (coinciding with point O) has zero acceleration. Hence this can be treated as a statics problem. Find an expression for the force F.
A heavy pump casing with a mass m is to be lifted off the ground using a crane. 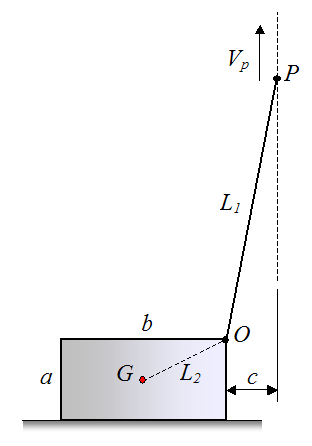 For simplicity, the motion is assumed to be two-dimensional, and the pump casing is represented by a rectangle having side dimensions ab (see figure). A cable of length L1 is attached to the crane (at point P) and the pump casing (at point O). The crane pulls up vertically on the cable with a constant velocity Vp. The center of mass G of the pump casing is assumed to lie in the center of the rectangle. It is located at a distance L2 from point O. The right side of the pump casing is located at a horizontal distance c from the vertical line passing though point P.
Find the maximum cable tension during the lift, for the part of the lift before the pump casing loses contact with the ground (lift off). • The friction between the pump casing and ground is high enough so that the pump casing does not slide along the ground (towards the right), before lift off occurs. • Before lift off occurs, dynamic effects are negligible and this can be treated as a statics problem. • The mass of the cable can be neglected.